Brushing your teeth twice a day should be part of your dental hygiene routine. Flossing is another necessary part of taking care of your mouth, teeth and gums. Flossing should be done on a daily basis, usually right before going to bed. But during the day, after eating a meal when you have a chunk of food stuck in your tooth, using a toothpick is a handy way to remove the particle, give your tongue a break from digging at it and also keep your mouth clean and fresh. Toothpicks are sliver-like pieces of wood or plastic used for stabbing pieces of party foods or for cleaning in between the teeth after eating. They can be flat or round, plain, brightly colored or fringed with plastic. They can even be flavored or fluorinated. 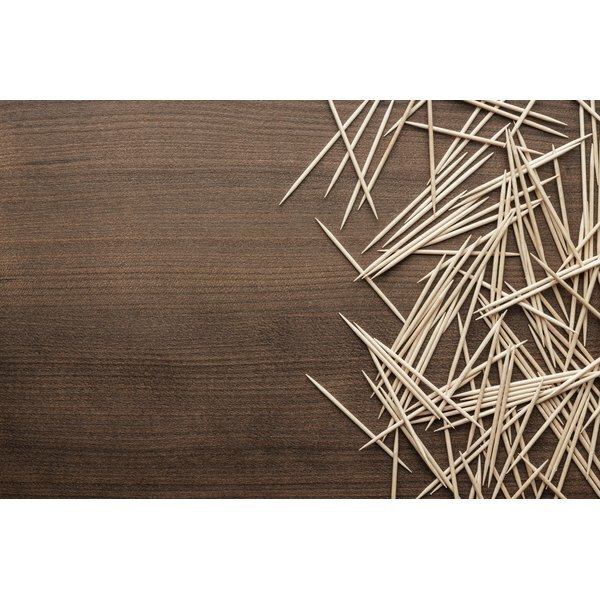 Wide toothpicks, such as Stim-U-Dent, are useful for wide spaces between teeth, while narrow toothpicks, which are harder to find, can fit between tiny gaps. Dental floss also comes in a variety of materials, colors, flavors. It can be waxed, which is slipperier and better for flossing tight spaces, or unwaxed, which frays less than waxed. Popular flavors are wintergreen and cinnamon. A wide type of floss called dental tape is effective for teeth with large spaces. To properly use a toothpick, use a light, careful touch to loosen the food particle so as not to damage your teeth or gums. Vigorous use of a toothpick can cause damage to delicate gums, particularly if you have sensitive or receding gums. Dental floss must also be used gently. You should guide it between your teeth without using too much force or you can cut your gums. Rub it back and forth, then up and down, curving around each tooth. Toothpicks and dental floss are designed to access and clean areas where toothbrush bristles cannot reach. Cleaning between the teeth, under dental work and along the gum line, will remove debris that can cause bacteria and jeopardize the health of your mouth. A floss threader is a tool that will help you floss underneath bridgework. A threader is shaped like a large plastic needle with a big eye, or loop. The floss goes through the loop and the threader goes between the bridge and the gum, taking the floss along with it. You can then get underneath the false tooth and along the sides of the abutting teeth. Using a toothpick should never take the place of flossing or brushing your teeth. They are simply an option for removing food that has gotten stuck in your teeth after eating a meal. Some people think using a toothpick at the table is a breach of etiquette, so you might want to wait until you are alone before breaking out your toothpick. You certainly would never floss at the table. Flossing should be done once a day. There are no similar guidelines for toothpicks, but rather are used on an as-needed basis.